A traditional holiday dinner for a Jewish family finds the homemaker slaving over a hot stove. 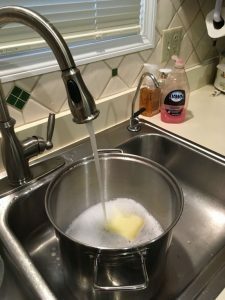 It’s astounding how many things have to boil in big pots. 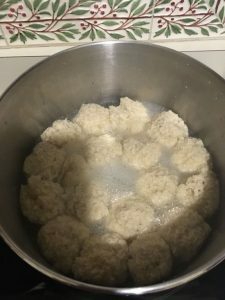 There’s the chicken broth, and the quadruple batch of matzo balls that will ultimately be dropped into that broth. There’s the gefilte fish, and let’s not forget the five pounds of potatoes for mashing. In each case big cauldrons of liquid need to bubble away on the stove. I use the word cauldron intentionally because all that work puts me in a wicked mood. The chicken broth alone takes hours to bubble. 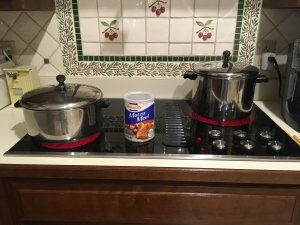 And where exactly do you find a pot that holds three five-pound chickens and all the vegetables that need to go into the soup according to the Barefoot Contessa, Ina Garten? I have yet to figure that out. And quite frankly that puts me in a dicey mood long before I even factor in having to wash all those pots. 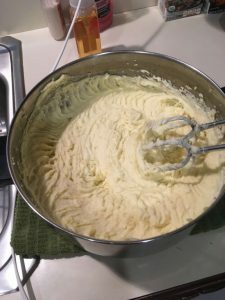 With Rosh Hashana, the Jewish New Year, just a week or so away, I have about two dozen dinner guests to prepare for, but of course that’s not all that’s cooking in my life. 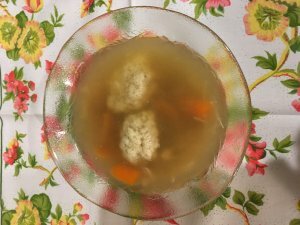 Move over matzo balls, I need to write a blog for my website! Thus I had the great idea of killing two birds (chickens?) 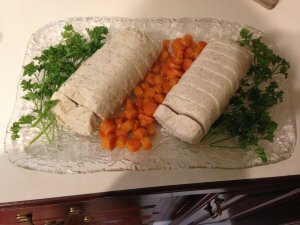 with one stone by writing a blog about the cooking experience. My only problem was this: many of my upcoming holiday guests read my blog. And I don’t want them to think that they are unwelcome for dinner. Nor do I want them to think that I am ready to pass the pots to a new hostess for future years. I’m not! I want to be the main mama in this family! But that doesn’t take away from the fact that all the cooking is daunting. Trying to figure out how to write this blog I happened to go to Friday night services where my rabbi, Michael Danziger, gave a sermon that solved my problem. He told the story of his much beloved niece who visited Cincinnati for the summer. And though he saw her frequently, he could’ve seen her more. But he didn’t realize that until it was time for her to leave. And so he was beating himself up for not placing her in a higher position in his hierarchy of important activities. He told this story as he suggested to us that we realize the significance of the upcoming holidays and make them central to our lives instead of just squeezing them in to an already too busy life. Bottom line: live the holiday with intention. I am passing my religious traditions down to my kids and grandkids. I am giving them the tastes, smells, sights, and sounds of the holiday. I am modeling my belief that family is important by rounding them all up and giving them a good time. I am showing them the importance of an extended family as I invite my daughters’ in-laws, my ex-husband (their dad and gramps), and a handful of very dear friends who are special in our lives. As for all that other “important” stuff in my life, you know, like reading email, social media posts, and the various novels that capture my attention, it can wait. And so off I go to the grocery store looking forward to giving my full attention to the shopping and even hoping to enjoy the experience. And as I purchase the three five-pound roasting chickens, onions, carrots, celery, parsnips, garlic; and fresh parsley, thyme, and dill that Ina requires me to buy, (and that’s just for the soup) I will be grateful that I am healthy enough to do all this cooking and grateful that all my significant others are hale and hearty and able to enjoy the feast that I will prepare for them with love. Love the description of all the love that takes place in your kitchen, and in my kiitchen as well, though not for as many! Still, for many or few, the love and traditions are ours to pass down!! And we do so gratefully! It is a lot of work but you’re right, worth it for the memories & tradition! Thanks, Mom. I know it’s a lot and we appreciate it. You’re creating memories that will last a lifetime. Thanks, Shana! Your wonderful round challahs will always be part of the fond memories. Yum! Thanks Lori. I know how much work is involved with the holidays because us, non- Jewish mothers, have Christmas! However, all of your work was appreciated by all. Dinner was fabulous. My Son, your son-in-law, was making dinner for his family one night and called me to ask how to make a brisket. I absolutely gasped at the question. I reminded him that his Mother-law, you, was Jewish and an expert at making very wonderful brisket. I suggested he call you and I promptly hung up the phone! Thank you Cindy! I can’t imagine having to do all the massive gift shopping on top of all the cooking for Christmas. Let’s both keep it up! And your brisket story is a hoot. Thanks for sharing it!! Wendy! Thanks for reading and commenting! And happy and healthy new year to all of you! Great blog, as usual. It’s like being in the kitchen with you! Loved the comments and all the appreciation shown by the family and extended family. Especially, Cindy’s! Thanks, Vera! Cindy’s brisket story is wonderful. I am glad to be an expert at something!! Boy, did I need this post, Lorie! I’m hosting a Break-the-Fast for possibly 13 people in my not-large house next week and am finding the prospect both exciting and daunting all at the same time! Thanks for reminding me of what’s truly important about having such a gathering. Thank you very much, Rose. I appreciate hearing from you and I am glad that my story helped you. Let me know how the break-the-fast goes!